Sugar Dog Stories – Peaches & Cream | Sugar Dogs International, Inc. 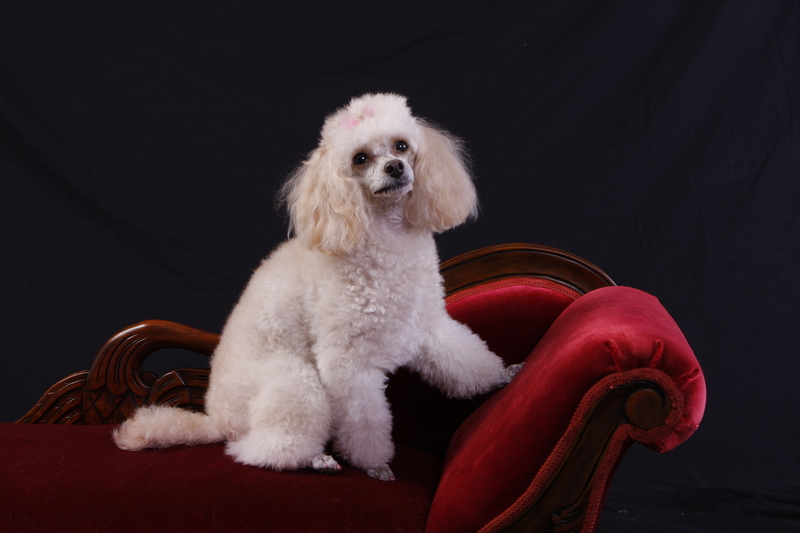 The Sugar Dog Stories © Sugar Dogs International, Inc.
My name is Paula’s Peaches & Cream and I’m an apricot Poodle. I weigh 8.4 pounds. My mistress, who I call Mimi, has written a bunch of stories about me ‘cause I’m cute and she loves me, and she’s a writer. Her Daddy was a writer too and she has a couple of cousins who are writers so it must run in our family. Our people are of Scot-Irish and American Indian descent. Because I’m a French girl and my Mimi knows a lot about history, she calls me Peach McGillacutty sometimes. Mimi says that the Scots and the French go back a long way and that if you were born before 1912 in France or Scotland that you were automatically a citizen of both countries. Mimi’s family immigrated to the United States a long time before that and so they are real Americans but I’m a French girl. Actually I was born at Knights Station but that’s another story. I started having adventures almost immediately when Mimi bought me from a breeder named Shirley Ercoli. I call her Grandma Shirley ‘cause my real Poodle Mother, Isabella “Belle” Francesca, still lives with her. My real mother is pretty. So is my Daddy. In fact, he’s a champion ‘cause he’s so very handsome and well behaved. His name is Dylor Noble Justice and he’s famous. I’m famous too; a lot of people don’t just know it yet. I’m famous at my vet’s office, Animal Wellness Center in Plant City, where I’ve been Pet of the Month and appeared in Focus magazine. My vet, Dr. Jennifer Conner says I’m perfect and my Mimi agrees. I’m famous at DOGMA mobile grooming spa. They take good care of us in our own driveway. Sugar Boy and I don’t even have to leave Sugar Dogs Headquarters for baths and grooming. They have fun dog parties but that’s another story. I’m a diabetic alert dog. Mimi and I live together. Mimi has juvenile onset or Type I diabetes. She takes insulin from an insulin pump. Sometimes in the night, her blood sugar drops really low and I sleep with her. So when her sugar drops too low, I claw at her and bark to wake her up. Then we get up and go to the kitchen and she sticks her finger to test her blood glucose level, and then she eats something and has a glass of milk. She’s trying to diet and so usually she only has a little bite of something and drinks a glass of milk and we go back to bed. It’s my job you see to help her. I’m a working dog! Service dogs are trained individually to help people who are handicapped. You may have seen a service dog with a blind person, helping to lead them to wherever they are going. Or you may have seen a big dog pulling a wheelchair for a person who has mobility problems. Dogs help all kinds of people, who have all kinds of handicaps. Service dogs can go to all kinds of places with the people that they help. I’ve eaten in some of the best restaurants in town! I have been turned away a few times, once at a Starbucks in Gainesville, FL when a lady started screaming at my Mimi to “Get that dog out of here!” That lady had never heard of a diabetic alert dog and my Mimi took me out to the car and we left. The baristas behind the counter were really nice and knew I was there, but the manager lady was really mean. She wouldn’t even listen to my Mimi about it. She thought I was a pet. I had been in other Starbucks before and no one had been mean to us, but that manager lady said, “NO DOGS ALLOWED!” She did not know the law. Recently, the same kind of thing happened at Roy’s Restaurant in Steinhatchee, FL when we all got thrown out right at Mimi’s supper time. Mimi says next time it happens, she plans to call the police because it is against the law to deny a working service dog entry with its human partner. (In Florida, it’s a second-degree misdemeanor and upon conviction carries a penalty of 60 days imprisonment or a $500.00 fine!) We also have to report it to the state and federal civil rights people. Mimi knows the law. She went to law school and works in a very nice law firm. I go to her office sometimes and lots of people who work there have dogs too. She learned about carbs from the registered dietitians at Watson Clinic. If we eat carbohydrates, and just about everything has carbs, it takes insulin to help turn that food into energy. Brian Friend, ARNP of Watson Clinic, LLC says, “Insulin is the key that unlocks the door to our cells so that our food can nourish our bodies.” He and endocrinologist Thomas W. Oates, M.D. take good care of my Mimi too. Managing diabetes is more than just watching everything we eat, it includes emotions too. Stress can be a huge factor! We were at the Don CeSar Hotel on St. Petersburg Beach for Christmas one year and there was a man sitting near us who was a bad diabetic but I don’t think that he knew it. I got excited and growled at him. Everyone knows that I’m a ham and love attention, so something was wrong! Mimi had tested and I wasn’t alerting for her. That man needed something to eat. He was acting angry and talking loud. Sometimes diabetics get angry when they are hungry or have low blood sugar (hypoglycemia). He was really skinny, which is sometimes a sign of out of control diabetes or someone who has hyperglycemia. He was seated near us and when he had eaten a little bit, Mimi asked him if he was a diabetic and he said he wasn’t. He sure smelled like he had low blood sugar to me! There are about 20.8 million diabetics in the United States and about half of them don’t know that they are diabetics. Both diabetics with high blood sugar, and people with low blood sugar (who may not be diabetics) have funny smells. I have been trained to tell Mimi if she has low blood sugar. I’m not as good at telling her that she has high blood sugar ‘cause as a diabetic, it is high a lot of the time. In fact, sometimes diabetics with high blood sugar have very stinky breath. It’s a good thing that dog like stinky things! We do, you know! We can smell lots better than people. Robert J. Deschenes, Ph.D., Professor and Chairman of the College of Molecular Medicine at the University of South Florida understands that I know there are changes going on in Mimi’s body when her blood sugar begins to drop. Sometimes it drops dramatically, if she’s late having a meal or gets too much exercise like at a dog park with me and Sugar Boy, running and playing. “While we don’t exactly know how dogs know, they do know,” Dr. Deschenes said. Mimi says if a Poodle loves you and you are a diabetic, it will alert. She says I’m 85-90% accurate predicting the low blood sugars before they actually happen. Now, she usually just has a bite of something if she’s awake and I alert. When it is scary is when she is asleep and Sugar Boy and me have to work hard to wake her up. He licks her on the face and if that doesn’t work, I bark and claw at her. I’m not bragging about it, but I’ve clawed her lip so badly that it bled. This is serious business, being a Sugar Dog! Well, I hope you have learned something about service animals, and especially diabetic alert dogs. We are pretty special, saving our people’s lives all the time. So the next time you see a dog in a restaurant or in a public place where dogs usually are not allowed to go, you’ll know they are a service dog. Tell ‘em Peaches says “Hello! And that service dogs are allowed” based on the Americans with Disabilities Act of 1990, the Florida Civil Rights Act of 1992, and Florida Statute § 413.08.